How do we avoid a "cookie-cutter" look at my daughter's "no theme" wedding? Since even no theme has to have some kind of unifying motif just to make it interesting, I'm struggling how to accomplish that. We'd like to avoid the cuteness of hearts, bells, doves, etc., but I'm concerned that avoiding absolutely any kind of decorative touch will make the event rather bland and unmemorable. Also, the groom hates wine and the beach, so those motifs are also out. The phrase "Apple Of My Eye" keeps popping into my head which you could then use as your wedding motto and theme everything with beautiful green apples. Centerpieces could be a big square glass vase filled with green apples and then use colored ribbon to tie around the vase. 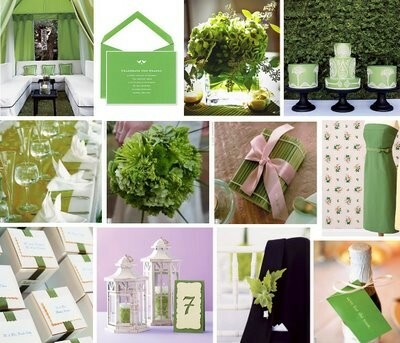 Or you could take your beautiful green color and use it to create beautiful green damask invitations. Then have apple green table runners and your floral centerpieces to decorate the tables. Use the green damask style for menus and table numbers. Both styles would be stunning, the apple green your daughter has chosen is a great color for her wedding.